The Museum of Horrors is back for its seventh run, this time featuring the story of a girl and her thirst for REVENGE! An abused girl with leprosy was unfairly treated and murdered by her gold-digger mother. She comes back to haunt her mother’s new family as an act of revenge and anger. Possessing her mother, she kills off every single one of the family members, and finally forced her mother to commit suicide by hanging herself. Please show your Peatix e-ticket to collect your actual ticket as well as vouchers at the entrance of Museum of Horrors VII (*SCAPE The Ground Theatre, Level 2). You may visit the Museum of Horrors at any time during the opening hours, regardless of the date/time stated on your e-ticket. Your ticket is for a one-time use only. Introduce yourself to the haunted house, and prepare yourself for what is to come. Why are there graves everywhere? Who’s this quiet gardener sweeping up leaves and body parts? Why is he alive? Be careful as you pass this room by, you’ll never know what lies on the bed. You may hear cries for help as you make your way through the bathroom, but it’s best to move on and not turn back. What’s with that wailing? Why is there a noose? Beware as you walk through the toys scattered over the room, you do not want to be the next victim. This is your only chance to escape via the basement. Make it quick! Tickets can be purchase at venue and online. For further information, visit Museum Of Horrors 7 – peatix website. Seven Deadlier Sins – Malice, Obsession, Manipulation, Narcissism, Cruelty, Deception and Perversion. The Seven Deadlier Sins are embodied by seven iconic characters called the Sinisters. Google this event yourself for more info. Sorry. Or you may want to check out other exciting Halloween Events. 2017 and every year on actual Halloween, 31st October, there will be a massive Halloween Trick Or Treat happening in Woodlands Woodgrove neighbourhood. Please help Caring for Cambodia by donating toothbrushes this Halloween! Clarke Quay’s signature Halloween event returns more Spooktacular than before on Saturday, 29 October from 8.00pm! 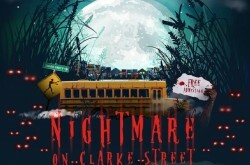 Join us at Nightmare on Clarke Street inspired by horror encounters after a zombie apocalypse in an Abandoned Hotel, a Bloody Butcher Shop and taking center stage would be the devastation of Clarke Street whereby the living dead rules the streets. Start your nightmare tour of Clarke Street at the Clarke Quay Abandoned Hotel located right at the entrance of Clarke Quay (near to taxi stand) and be greeted by our concierge for a frightfully fun Check-In. If gore is your thing, stop by the Bloody Butcher Shop at the Tan Tye Gate (near to McGettigan’s) to witness the massacre by the hungry butchers (or maybe zombies). Hosted by Sonia Nicola Chew – Official & Kimberley Wang from 987FM, get immersed in the Halloween fun with sinister stage games with the duo and get spotted by them in your best costume and you may stand a chance to win up to $200 worth of Highlander Clarke Quay vouchers! Get treated to a night of epic performances by Stereofly & HigherGround and groove to the beats with DJ Zest One from Highlander Clarke Quay where they will bring you a spooktacular night of Halloween haunting and mayhem. Quench your thirst for blood at the pop-up Highlander bar located at the Fountain Square where you could get all the specially curated Halloween booze to get the night started. Can’t decide what character to be? Be dauntless and step in for a creepy make-over with our face painters & airbrush tattoo artist! 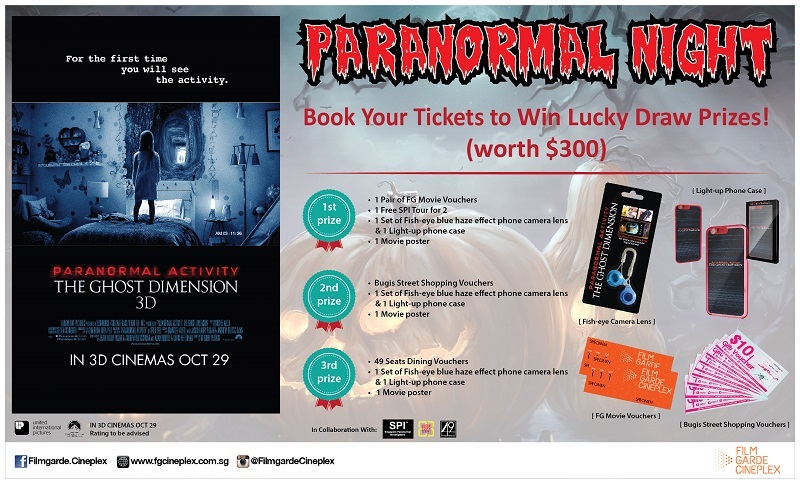 Beyond the scares, make your Halloween even more terrifying with special deals and themed parties at many outlets around Clarke Quay such as Attica Singapore, Crazy Elephant, The Chupitos Bar, f.Club Singapore, Harry’s Bar Singapore, Highlander Clarke Quay, Hooters Singapore, Paulaner at Clarke Quay, Prive Clarke Quay and much more! 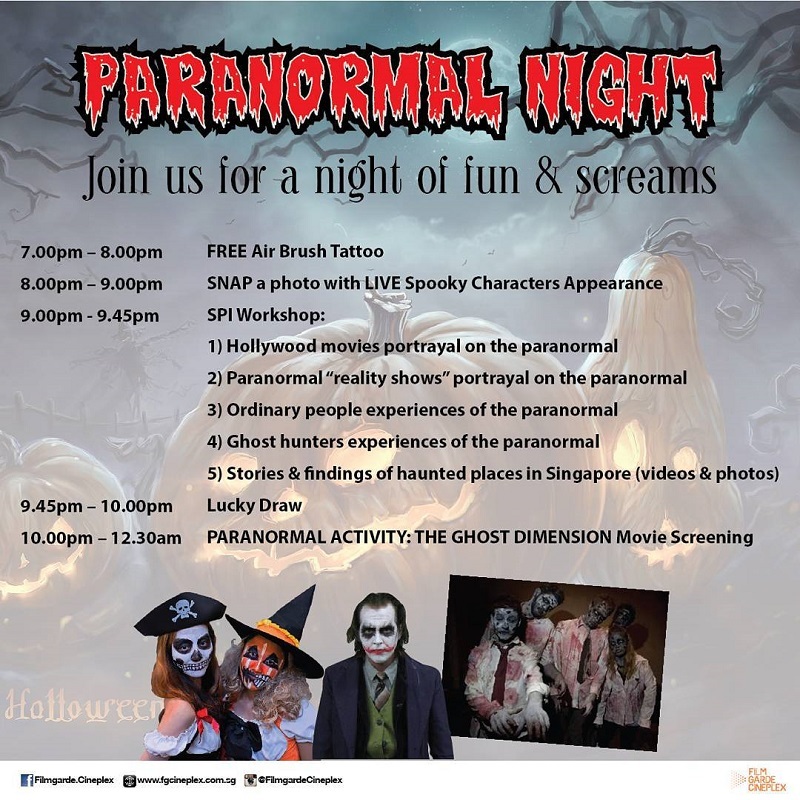 Come join us for a freaky, spooky and creepy Halloween experience at Clarke Quay! 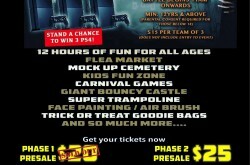 – Halloween Axe-Travaganza hosted by Sonia Chew & Kimberly Wang From 987 FM. – Pop-up Highlander Bar at the Fountain Square to quench your thirst all night! – Best-Dressed contest and Stage Games for a chance to win attractive prizes! Thriller In The Park, Singapore’s first Halloween carnival featuring extravagant costumes, a carnival atmosphere, top local acts and DJs for a 12 hour Extravaganza. The event is based around the concept of a picnic in a park with elaborate yet minimalistic stages, stalls and unique F&B outlets, bringing to you Pop-up bars and bistros. The Event will also feature some amazing talent on display. 1. Singapore’s First ZOMBIE MAZE! This is the first time Patrons will get to compete to get the best timing of the course while fending off and killing the undead. They will be decked out with state of the art weapons and gear but if they get captured they incur a time penalty. 2. The Cosplay Thriller Competition with a top prize of $1000, Cash and Prizes. Cosplayers from all walks of life will dress up in custom made costumes on a youtube based competition. 4. 2 Amazing Stages and an awesome dance party after. 7. Children below the age of 12 Enter Free. 9. A Giant Picnic Lawn for all to enjoy. 10. A Party to look forward to every year. Set against the beautiful backdrop of Fort Canning Park, get your hearts pounding into the night with 12 hours of revelry as we transform the garden into a fright-fest with Singapore’s first ever mock-up cemetery and zombie maze this Halloween! So dust off your picnic blankets, put on your dancing shoes and throw on your scariest costumes for the first ever THRILLER IN THE PARK! Ticket price includes a bottle of Sparkling Wine/Champagne. VIP Ticket holders get full access to the special VIP lounge and will be treated with periodic free shots and drinks, and get to hang out in the only air-conditioned area at the venue. Tickets can be purchase at the venue or online. Come join us this Halloween at Gallop Stable as we take you on a spine-tingling adventure, 3 levels of HORROR, 81 rooms, 24 scares in a REAL abandoned building in Singapore. 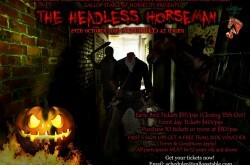 Get behind the story of the unrested souls, serial killings and The Headless Horseman. * All participants must be 12 years old and above, children below the age of 12 must be accompanied by a guardian. For bookings email: scheduler@gallopstable.com or call 6463 6012 for details. Google this event yourself for more info. Thanks. 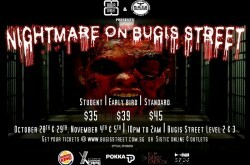 Bugis Street & House of the Unknown Productions are proud to present Nightmare on Bugis Street. With 2 scare routes, this year’s iteration is bigger and even scarier, making it the Halloween event not to be missed! Dark alleys, the creepiest puppets, and scary prison inmates will surely send chills down your spine. This Halloween, come and experience your greatest Nightmare on Bugis Street. Level 1: Late Night Shopping, Flea Market, DJ, Photo Booth, Registration, Ticketing. Come get scared outta your pants and treat yourself to some retail therapy! Y’know what they say – shopping is better than a psychiatrist. Late Night Shopping & Flea Market happening on ALL 4 nights, 28, 29 October and 4, 5 November from 10pm to 2am. Get your tickets at bugisstreet.com.sg / SISTIC today! For further information, visit Bugis Street FB Event. Be drawn into the darkness with an evening to die for! Be Trick-or-Treated with our mystery draw, Boo-Fay refreshments, mini-games and a series of Disturbed Hauntings throughout the night at our Terroween – House of Torment! Participate in our scavenger hunt within the trails with prizes to be won! So why wait? Come dressed in your best costume and have this moment captured for eternity! STAY SCARED THIS OCTOBER WITH SPOOK-TAKULAR ACTIVITIES! 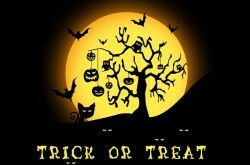 – Get Trick-or-Treated by mystery draw! 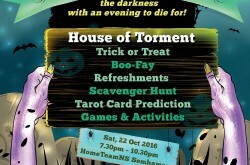 – Fringe activities and a serial killer of disturbing haunts throughout the spooky night of our House of Torment! – Scavenger hunt within the trails for more treats! Tickets can be purchase at the venue. 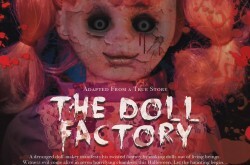 After one year of hiatus, Museum of Horrors is back … with its sixth edition, The Doll Factory. Adapted from a true story. A deranged doll maker murdered his family in order to preserve them as dolls forever. He manifests his twisted fantasy into a living nightmare in his factory where he captures living beings to be turned into the undead. Enter his factory with 7 terrifying chambers with real scare actors and witness evil come alive. Don’t be surprised to hear helpless screams from missing persons, taken by force, awaiting to be turned into another of the Doll Maker’s props. Inspect all the gore and body lying around in the freaky slaughter house. The only question is … who’s next? R.I.P, they say … The vengeful souls here are not quite ready to forgive and forget. It’s like going to a manufacturing factory in a twisted parallel universe – except with more flesh and gore. See no evil, hear no evil? We’re not sure if that applies in the Darkness Maze, where the only way out … is through. Witness the full g(l)ory of the Doll Maker’s entire collection here. Seen something you like? We’d advice against taking them home … you never know what/who’s following you back. For further information, visit Museum Of Horrors 6 – peatix website. 2016 and every year on actual Halloween, 31st October, there will be a massive Halloween Trick Or Treat happening in Woodlands Woodgrove neighbourhood. Join us for a night of fun & screams! 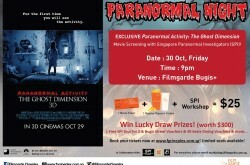 Grab your tickets to an Exclusive PARANORMAL ACTIVITY: THE GHOST DIMENSION movie screening with Singapore Paranormal Investigators (SPI)! For further information, visit Filmgarde website.